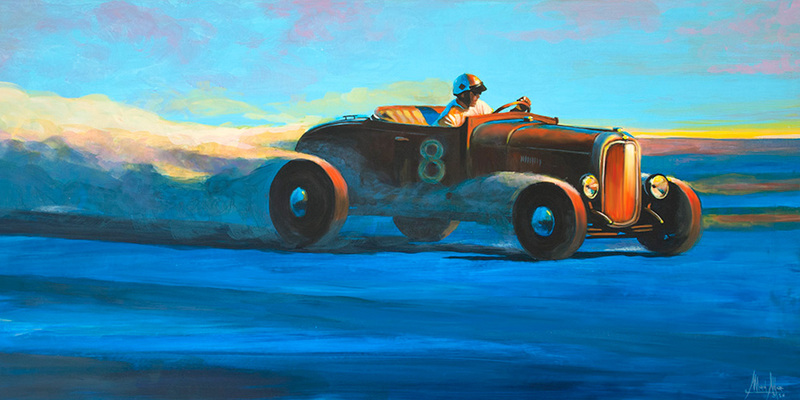 A vintage race car that hurtling at sunset on the Bonneville Salt Flats at the Bonneville Speedway. I imagine the first records conquered by Teddy Tezlaff in 1914, with his Blitzen Benz that reached a maximum tip of 228 km / h.
Realizing this painting was, for me, a great satisfaction, because it is not my usual technique with brushes. The pleasure of using real brushes, the scent of colors and their color rendition on wood are, for me, stimulating and relaxing at the same time. The result of this work, has quite satisfied me, considering it is the first with this style. I think that, with this technique, I will do other paintings of hot rod, motorbike, cafe racer and vintage race. Do you like it? Please share, thank you.